Post-Ph.D. career planning can be a daunting task, one that’s easy to sweep under the rug in the midst of classes, experiments, and thesis writing. But a new board-game style “road map” can guide your career exploration—and help you keep your momentum going once you’ve started the process. 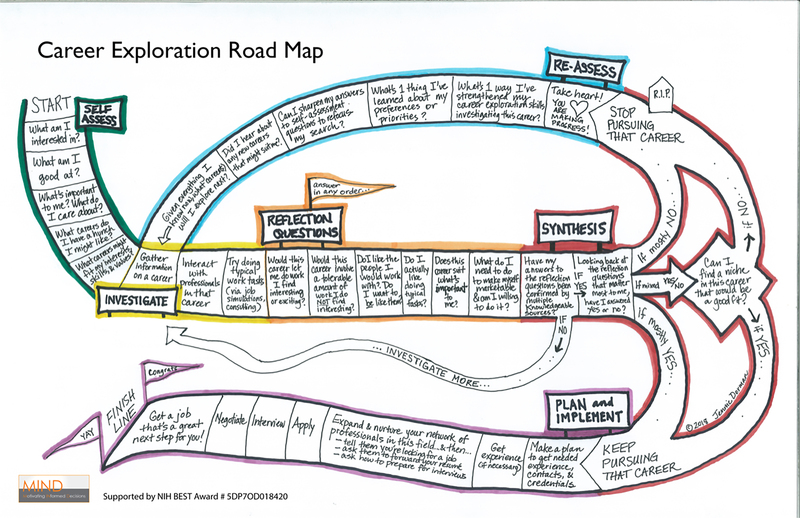 The map lays out a series of steps, including self-assessment, investigation, reflection, and synthesis. Career-seekers advance stickers—each representing a possible career—as they answer a series of questions such as, “Does this career suit what’s important to me?” The path isn’t linear; at forks in the road, you need to reflect on what you’ve learned and explicitly decide how to move forward. One juncture leads to an “R.I.P.” site for unsuitable careers, but the path doesn’t end there. “[R]uling out a career is progress, even if it doesn’t always feel that way,” developers Jennie Dorman and Bill Lindstaedt of the University of California, San Francisco, wrote this week in Inside Higher Ed when the tool was released. So, the map offers an encouraging “Take heart! You are making progress!” then guides users through continued reflection and exploration to find options that are a good fit. Dorman and Lindstaedt recommend pinning the roadmap to a wall, where it can serve as a reminder of the progress that you’ve made and what’s next in the career-exploration process. That can help career-seekers get unstuck and start moving again, they write.